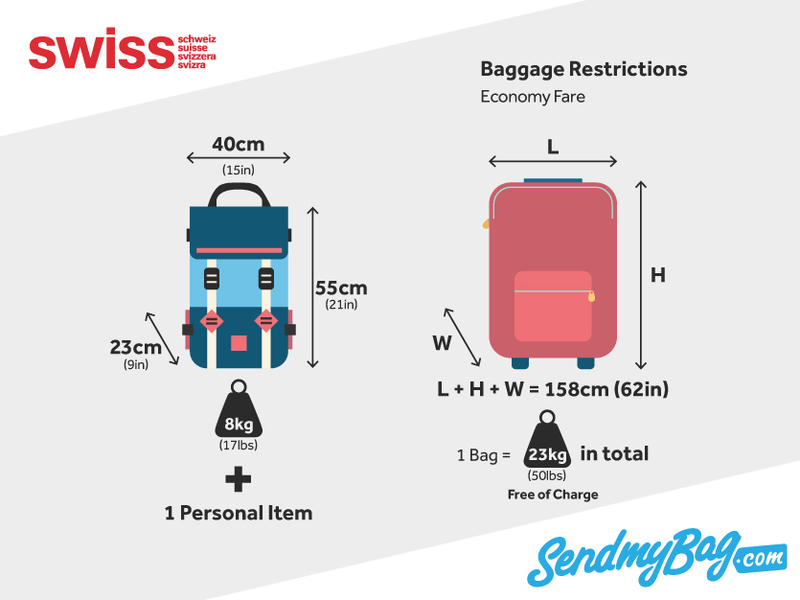 Struggling to adhere to Swiss Air’s baggage policies? Why not try luggage shipping with Send My Bag, so you don’t have to worry about incurring excess baggage fees? It also means you get to travel light and hop onto public transport for your onward journey without dragging suitcases behind you. Get your quick quote for luggage shipping to your destination. Economy Class are permitted 1 x 8 kg/ 17 lbs bag with maximum dimensions of 55 x 40 x 23 cm/ 21 x 15 x 9 inches. Business and First Class are permitted 2 x 8 kg/ 17 lbs bags. All passengers may also bring one personal item. Please be aware that if travelling on a smaller aircraft that is fully booked you may need to check your hand luggage at the gate. You can bring small instruments on board as hand luggage, provided they do not exceed the Swiss Air hand luggage allowance. A larger musical instrument can be brought on board if an extra seat is purchased for it. This must be done through a travel agent or Swiss point of sale. On European routes there is no allowance for Light fares. Economy Classic and Flex fares have an allowance of 1 x 23 kg/ 50 lbs. Business Class tickets include an allowance of 2 x 32 kg/ 70 lbs. No item of checked baggage may exceed 158 cm/ 62 inches in total dimensions nor weigh more than 32 kg/ 70 lbs. Looking for Swiss Airlines sized hand luggage?